The new Range Rover Velar is a mid-sized luxury SUV and it sits between the Evoque and the Sport for size and price. It’s the fourth model in the luxury SUV’s lineup and looks unmistakably like a Range Rover but it also has some new design features that are specific to the Velar such as the super-slim Matrix Laser-LED headlights, the slimmest headlight clusters ever fitted to a production Land Rover vehicle. The Velar combines the renowned Range Rover floating roof and continuous waistline with a simplicity that exudes confidence and individuality. It’s available in 13 exterior colours and 8 distinctive wheel designs ranging from 18 to 22″ with a choice of 4 finishes (the 18″ come as standard). 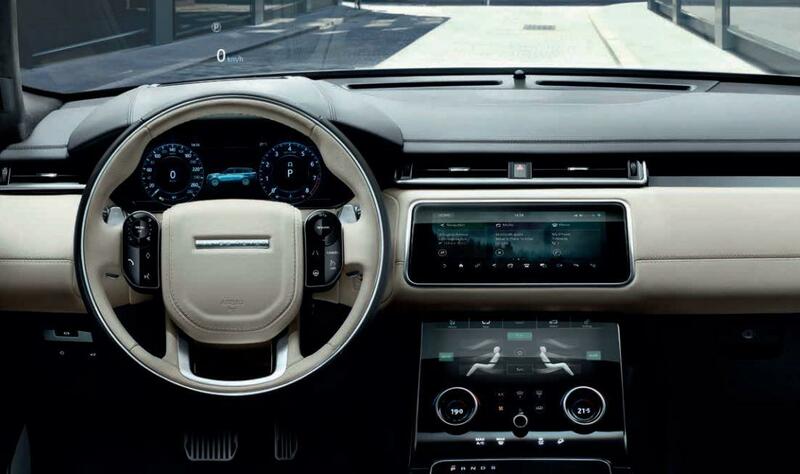 Inside the Velar is spacious and elegant and with Sports Command Driving Position, Head-Up Display, individual armrests and configurable mood lighting, every detail has been consider to provide a refined, contemporary driving experience. The main interior feature is the two 10-inch screens integrated behind black panels that are kept ‘secret-until-light’. For those animal lovers, there is an alternative to leather seating with the new, sustainable and vegetarian friendly Dapple Grey material developed in conjunction with Kvadrat (Europe’s leading manufacturers of high-quality design textiles). Leather seating is also available for those who want it. The Touch Pro Duo is the new standard touchscreen system which allows the user to simultaneously view and interact with multiple features at once, for example, you can use the navigation system in the upper screen whilst playing media on the lower screen. There are unique and hidden until-lit switches on the steering wheel which reduce the number of controls within the cabin. These capacitive switches accomplish a host of functions that you want the vehicle to perform. The optional high-definition 12.3-inch Interactive Driver Display lets you interact directly with the display and therefore control your media, make and receive phonecalls, and select features to populate your chosen view. There is optional Rear Seat Entertainment includes two 8-inch screens in the headrests which can play moves and TV channels, including digital, each is controlled individually. There is also 2 USB ports, one HDMI and Mobile High-Definition Link that supports most smartphones, tablets and other devices. Two sets of WhiteFire connected headphones and wireless remote are also provided. Something to keep the children occupied on long journeys. Remote is a multi-functional app that allows you to monitor, as well as interact with your Velar from your smartphone or smartwatch (compatible devices only). You can remotely start the engine to pre-condition the climate, lock and unlock the vehicle, locate your Velar and track your journeys – all via the app. Standard Driving Aids include: Autonomous Emergency Braking, Lane Departure Warning, Rear Parking Aid and Cruise Control with Speed Limiter. The Land Rover iGuide app uses the latest augmented reality technology to explain all the need-to-know features and controls of your Range Rover Velar. It also doubles as a mobile owners’ manual. The new Range Rover Velar comes in 6 engines (3 petrol, 3 diesel) and all engines are matched to ZF 8-speed automatic transmissions with all-wheel drive and Intelligent Driveline Dynamics. It comes in the following trims; Velar (2.0-litre D180 only), S, SE, HSE, R-Dynamic, R-Dynamic S, R-Dynamic SE, R-Dynamic HSE and the limited First Edition. The First Edition is available for 1 year only and is powered solely by the 3.0-litre V6 petrol and diesel engines and has a whole host of extra features as standard. The Velar is due in Ireland this summer and while the price hasn’t been released yet, it will be somewhere between the pricing of the Evoque (starting from €41,745) and the Sport (starting from €74,585) so it’s expected that prices will start from around the €60,000 mark. If your company is looking to lease or rent, contact us today on 01-4605250 or email info@jensenfleet.ie to discuss your options and let us find the best package for you.